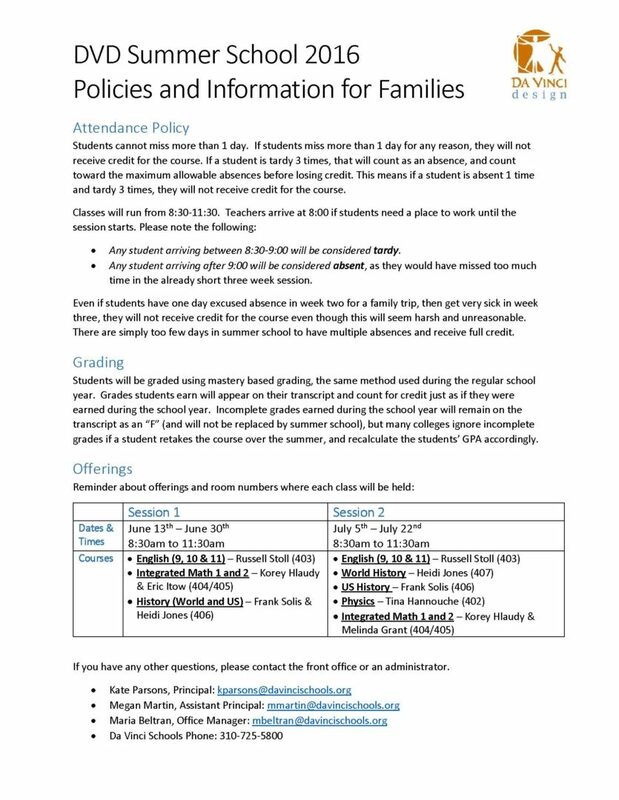 Summary: For the incoming 10th grade World History students and families, a summer reading assignment was handed out to freshman at the of the year. This assignment is designed to prepare students for their first social science course at Da Vinci Design, as well as to begin thinking critically about history. Information and instructions as well as a PDF copy of the book are located on Heidi Jones’ Weebly website. If you have any questions, please do not hesitate to contact Heidi Jones. Summary: Read The Road by Cormac McCarthy, annotate the text, and complete the reading log by August 18. Please contact the teachers directly with any questions as you work on your assignments. Enjoy the rest of your summer! Designers – ESMoA (El Segundo Museum of Art) is offering FREE arts programming for rising high school sophomores, juniors and seniors in Summer 2016! Summer Camp @ ESMoA is a two-week studio intensive workshop coinciding with Experience 23: MATTER. Campers will explore the Experience through gallery discussion and art activities. They will work alongside professional, working artists and have the opportunity to build and expand upon their own portfolio. Camp runs Monday, July 18 – Friday, July 29 from 10 am- 3 pm each day, but camp staff can be flexible and accommodate students’ work schedules. There is limited space, but spots are still available so apply as soon as you can! Class of 2016 Graduated Seniors- don’t forget to order your Antioch transcript! Please check off “First Transcript Order- Complementary Transcript Packet” in the above form. Please make your request after June 22nd to allow your Art History grades and comments to post. Summer School Session 1 begins tomorrow! Designers, if you enrolled in session 1 of summer school, it starts tomorrow, June 13! Information is below, along with room numbers. All classes will take place at the back of campus in the senior portables. We will see you in the morning. Please arrive by 8:30 at the latest. This is a reminder for the students who are enrolled in the Princeton Review ACT Prep class that although school is not in session on June 9th (Thursday), there will still be an ACT Prep class. It is important that students attend this last class because it will be their last class to review and ask questions of the instructor before the actual ACT test on Saturday, June 11, 2016. The class starting time (4:15pm) and the classroom will remain the same. Last Day of School is Tomorrow! Designers – tomorrow, Tuesday, June 8th is the last day of school for the 2015-16 year! 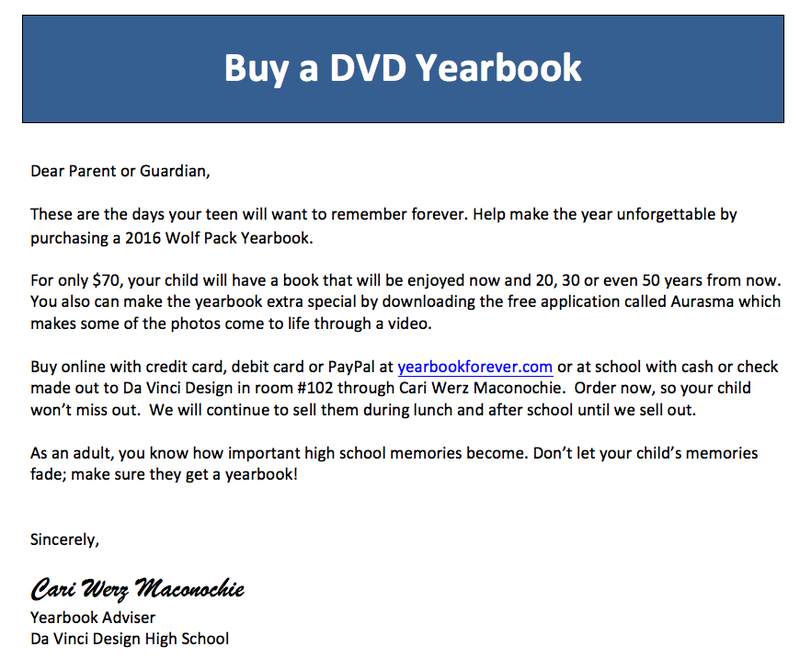 This will be the last day to hand in service hours, and it is also the last CD of the year! Tomorrow is a full day running 9:00-3:55. The schedule is below. If you are attending summer school, the first session starts Monday, June 13th at 8 am. 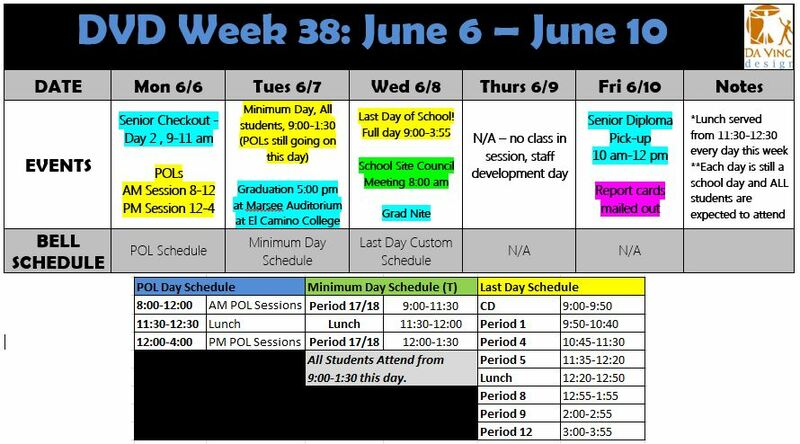 Week 38 Update – Last Week, Graduation, Senior Info and more! Designers, next week is our last week together for the 15-16 school year! Week 38 update is below. Monday is a regularly scheduled POL day (AM and PM sessions). 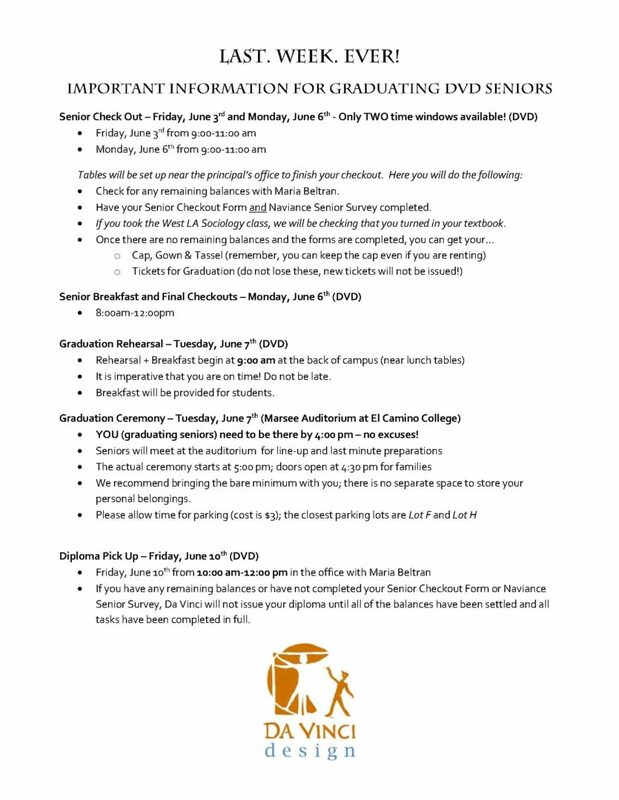 Tuesday is a minimum day due to graduation (9:00-1:30) and all students should be present on campus during this time. POLs will still run as normally scheduled, which means some students may need to stay past the 1:30 time to finish their POL. Report cards will be mailed out Friday afternoon. Please allow 2-3 business days for them to arrive. Summer School Session 1 begins Monday 6/13 if you are enrolled. Caps & Gowns: Seniors can pick up their caps, gowns and tickets either Friday 6/3 or Monday 6/6 from 9:00-11:00 at the principal’s office. Grad Nite: Wednesday 6/8, be at DVD by 3 pm, depart by 4 pm, arrive back by 3 am.